Michel David, 2nd son and 2nd child of Jean Pierre David and Marie Magdelaine Monmellian, was born about 1719. The exact date and place of Michel's birth is unknown at this time, however, numerous abstracts tie back to his approximate birth year. As for his place of birth, Michel was born somewhere between Québec City, Acadie or the Fortress of Louisbourg. Michel's presence in Louisbourg is indirectly recorded in the Louisbourg 1724 Census which lists his father, Jean David dit Saint Michel of Nantes, a blacksmith, a wife, Marie Magdelaine Monmellian, 3 sons under 15, Pierre, Michel and Jean Jacques and 2 daughters, Magdeleine and Marie Josephe. In addition, the Louisbourg 1726 Census which also indirectly includes Michel continues to coincide with the Louisbourg 1724 Census with the addition of Marie Josephe's brother, Jean Baptiste David, to Jean Pierre and Marie Magdelaine's family in 23 July 1725. According to Eric Krause's Memorandum HF 25 1989, Jean Pierre and Marie Magdelaine were still living at Louisbourg in 1744 along with their surviving children of "5 boys for certain, possibly 6 and 5 girls." These children would probably have included their sons Jean Jacques, Jean Baptiste, Francois, Louis, Claude Thomas and Jacques Andre and their daughters Marie Josephe, Francoise Charlotte, Jeanne Olive, Marie Magdeleine and Jeanne Angelique. The "possibly 6" son referred to was probably Michel who married Genevieve Hebert on 20 Jan 1744 in Grand-Pré, Acadie and was probably living there with his wife. 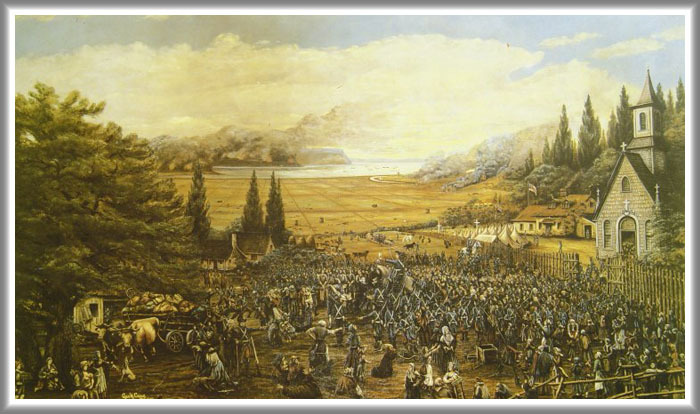 On 2 September 1755, British forces' Colonel John Winslow ordered all male Acadians 10 years and older at Grand-Pré, Acadie to assemble in Saint Charles-des-Mines Church in order to inform them that everyone and their families were to be deported from their home land. Winslow had a list prepared of all of the men and boys confined to the church in order to determine family names, the number of individuals detained, and if anyone was missing. Michel David's name was not on Winslow's list. he only David listed was a Jean Baptiste David, married to Marie Josette. As we know as fact, Michel and his family were deported together to Snow Hill, Maryland for eleven years. The question was, "Where was Michel when all the Grand-Pré Acadians were being rounded up"? 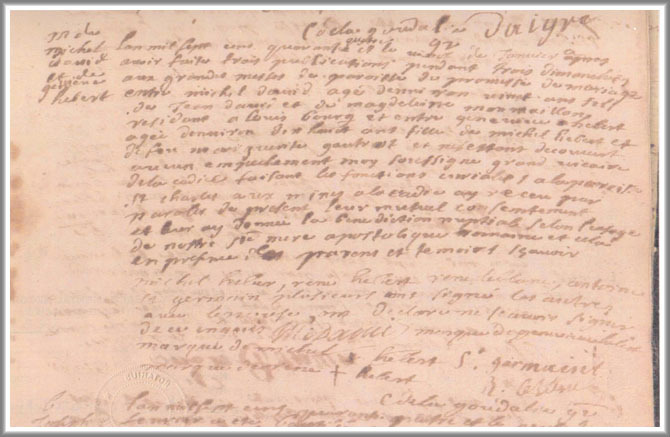 During one of fellow David family genealogist, Robert David's searches of the Fortress of Louisbourg archives databases, he came across the baptism record below for a Jean Michel Noel. Within this primary source record was the answer of Michel's whereabouts during the 1755 deportation of the Acadians from Acadie and the beginning of Le Grand Dérangement. Michel, having received word of the planned deportations by the British of Acadian families at Grand-Pré, somehow managed to return to Grand-Pré from Louisbourg, some 300 miles away, in time to rejoin his family before the sloop Elizabeth with 242 Acadian deportees aboard sailed on the 27th of October 1755 for the east coast of Maryland. Further documented evidence which notates Michel in Louisbourg during this period has been extracted and compiled from original source documents into the Fortress of Louisbourg Historical Memoranda Series 1964 to Present H F 25 1989 titled Jean Pierre David dit Saint Michel: Blacksmith authored by Eric Krause of Krause House Info-Research Solutions. 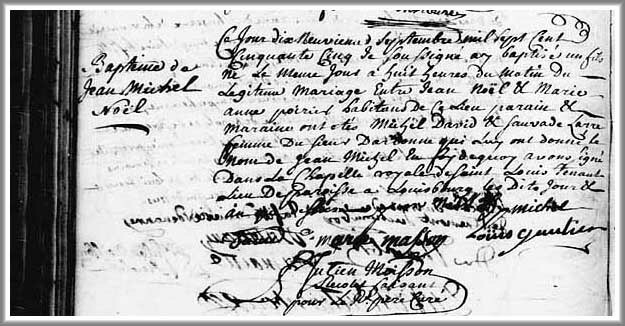 On 20th of January, 1744, Michel married Genevieve Hebert, born at Grand-Pré, Acadie on 21 Feb 1726 and baptized on ____________ . She was the daughter of Michel Hebert and Marguerite Gauterot. She died at St. James Parish, Louisiana and was buried on ____________. 1. Anne, a daughter born at Grand-Pré, Acadie on 02 November 1744. She died at ____________ on ____________. 2. Michel Lin, a son born at Grand-Pré, Acadie on 22 September 1746. He died at ____________ on ____________. 3. Joseph, a son born at Grand-Pré, Acadie on 07 November 1748. He died at New Orleans, Louisiana on 30 January 1773 at the age of 24 years. 4. Paul, a son born at Grand-Pré, Acadie beween 1754 and 1757. He died at Saint James Parish, Louisiana on 21 October 1815 at the age of 58 years. 5. Marie Madeleine, a daughter born at Snowhill, Maryland about 1757. She died at ____________ on 18 March 1758. 6. Jean Baptiste, a son born at Snowhill, Maryland about 1759. He died at Saint James Parish, Louisiana on 13 June 1810. 7. Claude, a son born at Snowhill, Maryland about 1761. He died at ____________ on ____________. 8. Angelique, a daughter born at Snowhill, Maryland about 1765. She died at Livingston Parish, Louisiana on 08 November 1836. 9. Jeanne, a daughter born at ___________ about 1767. She died at ____________ on ____________. 10. Pierre, a son born at New Orleans, Louisiana on 05 March 1770. He died ___________on _________. 11. Rozallie, a daughter born at Saint James Parish, Convent, Louisiana about 1772. He died ___________on _________. 12. Marie, a daughter born at Saint James Parish, Convent, Louisiana about 1774. She died at ____________ on ____________.